Estimates for Pattern Energy Group Inc. PEGI have been revised upward in the past 90 days, which reflects analysts’ optimism in the stock. The Zacks Consensus Estimate for 2018 earnings have surged 41.0% to $1.51. Production from renewable sources, cost-saving initiatives and long-term power sales agreement are tailwinds for Pattern Energy. 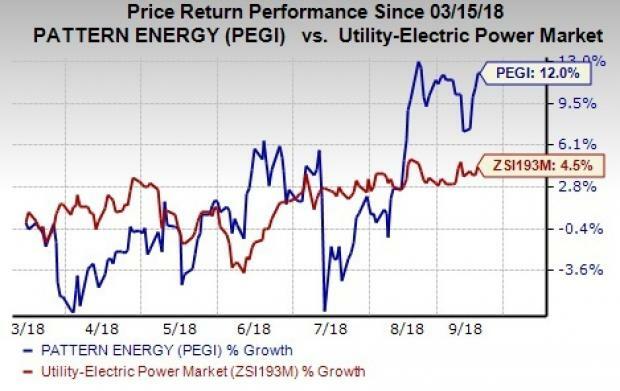 Shares of Pattern Energy have returned 12.0% in the past six months compared with the industry’s rise of 4.5% The company carries a Zacks Rank #3 (Hold). Let’s focus on the factors that make Pattern Energy a stock to retain. Pattern Energy pulled off an average positive earnings surprise of 310.93 % in the last four quarters. Year-over-year earnings growth for 2018 is estimated at 694.74%. Year-over-year sales growth for 2018 is estimated at 22.58%. A stable financial position enables Pattern Energy to raise shareholders’ value through the payment of regular dividends and repurchase of shares. The company’s current dividend yield is 8.33%, higher than the industry’s 3.21% and Zacks S&P 500 composite’s 1.78%. Expected long-term growth of the company is pegged at 29%. Pattern Energy has an impressive VGM Score of B. Here V stands for Value, G for Growth and M for Momentum with the score being a weighted combination of all three factors. Back tested results show that stocks with a favorable VGM Score of A or B coupled with a bullish Zacks Rank are the best investment options. Pattern Energy is unaffected by short-term changes in business trends. Nearly 92% of the company’s production is from renewable projects, which is sold under long-term fixed power price sale agreements. The weighted average remaining contract life of the agreements is nearly 14 years as of Dec 31, 2017. A few better-ranked stocks from the same space are FirstEnergy Corp. FE, IDACORP, Inc. IDA and DTE Energy Company DTE. All the stocks carry a Zacks Rank #2 (Buy). You can see the complete list of today’s Zacks #1 Rank (Strong Buy) stocks here. FirstEnergy delivered an average positive earnings surprise of 4.74% in the last four quarters. The Zacks Consensus Estimate for 2018 and 2019 earnings moved up 3.0% and 0.4% in the past 60 days, respectively. IDACORP delivered an average positive earnings surprise of 10.10% in the last four quarters. The Zacks Consensus Estimate for 2018 and 2019 earnings inched up 2.1% and 0.9% in the past 60 days, respectively. DTE Energy pulled off an average positive earnings surprise of 5.69% in the last four quarters. The Zacks Consensus Estimate for 2018 and 2019 earnings moved up 6.7% and 3.6% in the past 60 days, respectively.